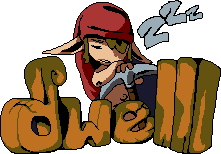 A cross between creativity, horror, and adventure, Dwell aims to be an ORPG like no other. Settle, create a village, and defend your friends from the horrible creatures who lurk in the forests. You can change the landscape, farm, or hunt in order to survive the conditions-- it's all up to you. Post news Report RSS	New Pixel Art! Since we've redone the game in C#, we decided to redo some of the graphics to be more cute! Here are what the new sprites look like! Hey guys! We're redoing a lot of our base graphics to fit in the new engine we've made! The new graphics use 8 directional movement and have a very cute style, check it out! Since we decided to rewrite the game a couple months ago, we've made astounding progress. Here are some notes about what we've done! Linux and Mac builds will be easy to construct now! Not a big fan of how the girls hands seem to be pushed out in a traditionally feminine pose. With such pixelated characters, why even bother differentiating? Why not just have them be generic and gender-less - let people impose their own gender on the default character? Traditionally feminine pose? They look nearly identical, except the female looks like she has slightly pointy-er features, and breasts of course. I personally don't mind it and I think the game is looking pretty neat. My only question is why would it matter for people to impose a gender on the character if they can simply choose a gender. The walking animation evokes a slightly pointed upward feminine hand pose. This is a personal observation and opinion. As for gender, there are a lot more genders than just male and female. For those people, they can't simply choose a gender that matches theirs if the only options are male and female.